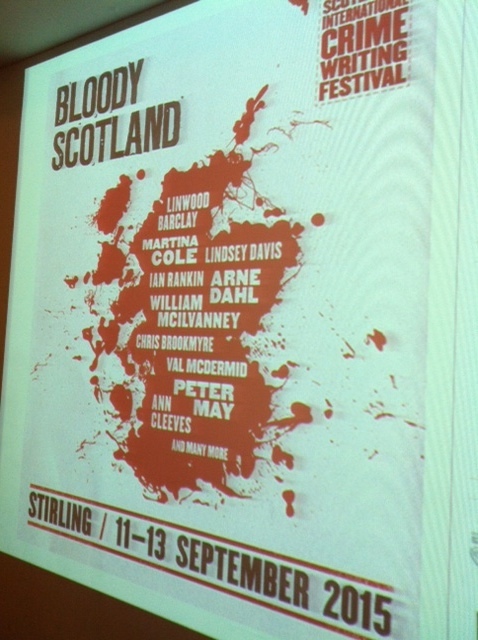 This week the marks the official launch of the 2015 Bloody Scotland Crime Writing Festival. The wonderful event runs this year from 11-13 September in the historic Scottish town of Stirling and is fast becoming one of the top crime writing festivals. The fabulous programme, announced this week, features exclusive appearances from Martina Cole and Linwood Barclay, and a brilliant range of events from interviews to panel sessions with best selling authors including Ian Rankin, Val McDermid, Ann Cleeves, Arne Dahl and over 50 other authors. There’s also some great evening entertainment including ‘Whose Crime is it Anyway?’ with Hardeep Singh Kohli, Christopher Brookmyre, Kevin Wignall and Caro Ramsey, ‘Crime at the Coo’ – an evening of readings, poems, stories and songs hosted by Craig Robertson – and the gala dinner where the fourth annual Bloody Scotland Crime Book of the Year Award will announced. On Sunday lunchtime, there’ll be the return of the infamous Scottish vs English All-Crime-Writers football game, with the English team hoping to settle some of last year’s scores! The festival will also celebrate Agatha Christie’s 125th anniversary with an spellbinding event looking at the grande dame of crime fiction’s obsession with poisons. Dr Kathryn Harkup, author of the book A is for Arsenic, and Christie expert Ragnar Jonasson, who has been Christie’s Icelandic translator since he was seventeen, will discuss the art of chemistry Christie used to kill the vast majority of her ‘victims’. For those looking to write crime fiction there’s the Bloody Scotland Crime Writing Masterclass – a full day of workshops including ‘The Craft of Crime Writing’ with Denise Mina, ‘Self-Editing for Crime Writers’ with Allan Guthrie, and ‘Screenwriting for Crime Writers’ with Alexandra Sokoloff. And for those ready to pitch their novel, there’s the popular ‘Pitch Perfect’ session where a line-up of unpublished authors get the chance to ‘live pitch’ to a panel of industry experts. I’ve been to this fantastic festival twice before and I’ve already booked my tickets for this year. Always a super-friendly festival, and with such an amazing star-studded programme, Bloody Scotland 2015 is going to be tremendous. Glad to hear you’ve booked your ticket already CBT! Hopefully we’ll get to meet in real life. I was ooh-ing and aah-ing over the brochure last night – some tough decisions to be made! Absolutely! It’s a fab line-up isn’t it! Brilliant! Couldn’t have hoped for better if I’d made up.a dream team line-up! I should order tickets rapidly shouldn’t I? As well as trying to find a cheap B & B in Stirling – was going to stay in Edinburgh but that rules out any socialising lol! Yes, definitely order tickets fast!